Flying, especially long haul, can leave you feeling absolutely knackered. From airborne diseases to jet lag and dehydration, holidaymakers face an array of health risks while travelling in the skies. However, according to Brisbane-based nutritionist Alessandra Trovato, taking a few simple precautions can make all the difference. Between the recycled air on planes, exposure to germs and dehydration, a strong immune system is key to ensuring a healthy holiday. Trovato recommends bringing an apple onboard (if you’re able to), as they’re loaded in vitamin C, which can boost your body’s ability to fight off airborne germs. Additionally, they’re packed with fibre which will help keep you full for long periods of time. “While vitamin C may not completely cure a cold, it can help ease the duration of symptoms and keep your immune system strong,” she says. If you’re prone to travel constipation and bloating, Trovato also recommends packing a probiotic supplement in your carry-on luggage. Probiotics are live bacteria and yeasts that help keep your gut healthy. “They are also a good option when you don’t have access to foods with probiotics such as yoghurt,” she adds. Lack of sleep can affect your immune system and make you more susceptible to sickness. If you’re on a long flight, sleeping as much as possible helps keep your immune system strong. It can be tempting to buy a meal at the departures gate, however if you’re prone to motion sickness or nausea, Trovato says it’s best to avoid a heavy meal right before a flight. Instead, she recommends filling up on nutritious eats before boarding your flight such as fruit, cheese and crackers, yogurt and veggies. “Motion sickness and nausea is caused by the pressure changes caused by take-off and landing. Snacking on crystallised ginger can help to relieve nausea,” she adds. During the flight, if you decide to opt for plane food, Trovato says to avoid snacking on sugary, processed foods and to try to have as many vegetables, fruits and whole grains as possible. “This will provide you with energising protein and no refined carbohydrates meaning your blood sugar and energy levels will remain stable,” she explains. Decreased movement and changes to air pressure can cause temporary poor circulation, which can be harmless, but it’s when the swelling causes deep vein thrombosis (DVT) that there can be real damage and even result in blood clots. One of the best ways to reduce your risk of getting a blood clot is to get up out of your seat and keep moving around the cabin as much as possible. It’s also worth asking for an aisle seat when checking in, so you don’t have to worry about people falling asleep and not being able to get out of your seat easily. Dehydration is common while flying, so Trovato says it’s important to drink plenty of water before and during the flight. 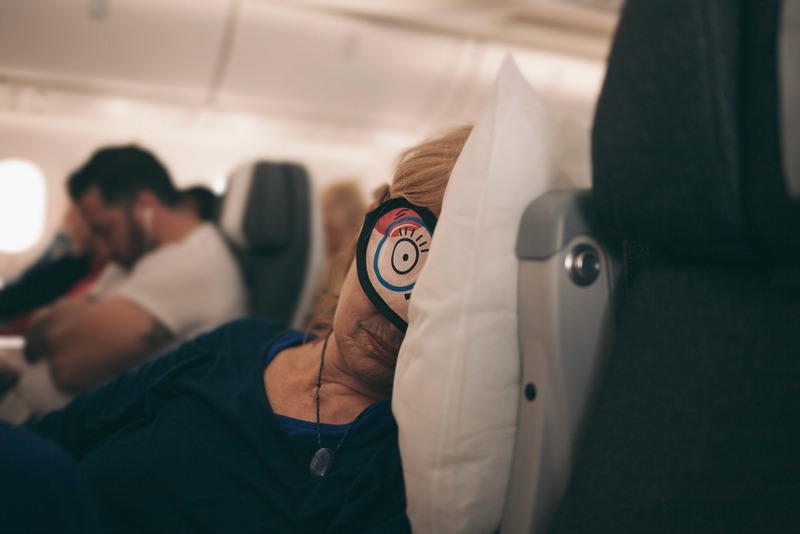 The humidity on planes is typically less than 20 per cent, Trovato explains, therefore the dry air can make you tired, groggy and prone to headaches. In fact, a humidity level between 45 to 55 per cent is considered comfortable for most people. “In the hours before the flight, be sure to hydrate and drink plenty of water,” she advises. Meanwhile, Trovato says to try limiting or avoiding caffeinated drinks and alcohol during the flight, as these drinks contribute to dehydrating faster. Do you have any tips to stay healthy while flying?